dance.net - Royal Blue Highland Dance Jacket (10245579) - Read article: Ballet, Jazz, Modern, Hip Hop, Tap, Irish, Disco, Twirling, Cheer: Photos, Chat, Games, Jobs, Events! Locked by Theresa (28613) on 2017-04-05 11:35:41 Sold! 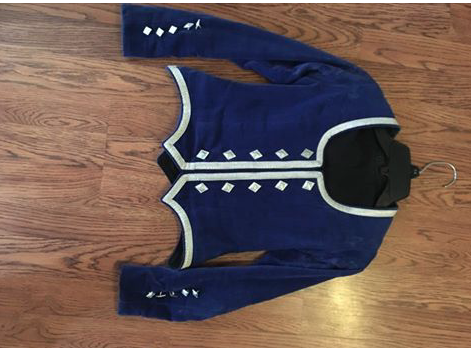 Royal blue highland jacket. Some wear around the shoulders but is not noticeable on stage. Perfect for a young pre-premier dancer. My daughter wore between the ages of 8-10, but she is very small and slim for her age, so go by the measurements.. Chest 13 inches across, Waist 13 1/2 inches across, Hip 14 1/2 inches across, Back of neck to point 16 1/2 inches, Sleeves 18 1/2 inches. Will be attending Spartan Tartan competition in Lansing, Mi if you wish to try it on.